Bolivian dancers resting in Tompkins Square Park. Jersey City was well represented. 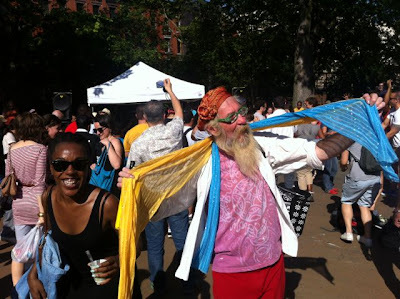 Here is our own Donald Gallagher groovin' along with Jamaican DanceHall Aerobics. 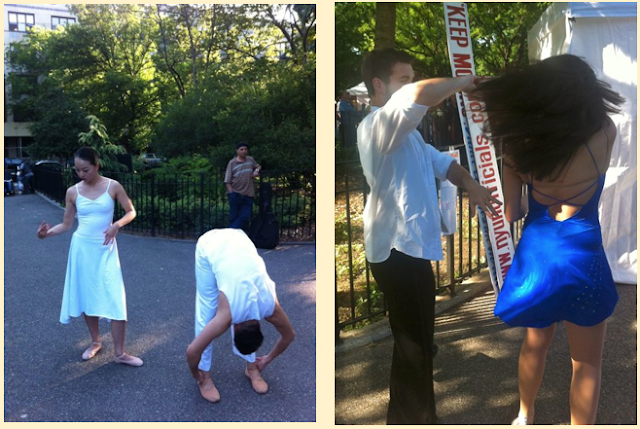 And Jersey City's Nimbus Dance Works performed an excerpt from choreographer Pedro Ruiz's Danzon. The the wires overhead were a surprise they dealt with admirably. 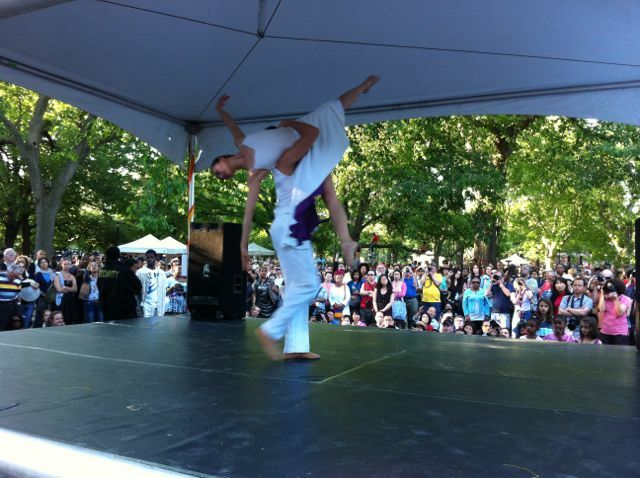 The company's 6th annual Jersey City Spring Season will be at Grace Church in Jersey City, June 7-9, 2012. You can purchase tickets here. Try not to miss it. Probably because I was the only person at the entire festival wearing a sport coat, they allowed me behind the stage to watch the dancers warm up. On the left: Nimbus Dance Works. On the right: Zouk Nation - a company from Brazil. And the finale, an absolute delight, was the The Isadore Duncan Dance Company. Note the little girls in front imitating the dancers. In celebration of Isadore Duncan's 135th birthday, the company will be performing May 22 - 26 at the Judson Memorial Church in the Village. You can buy tickets here.